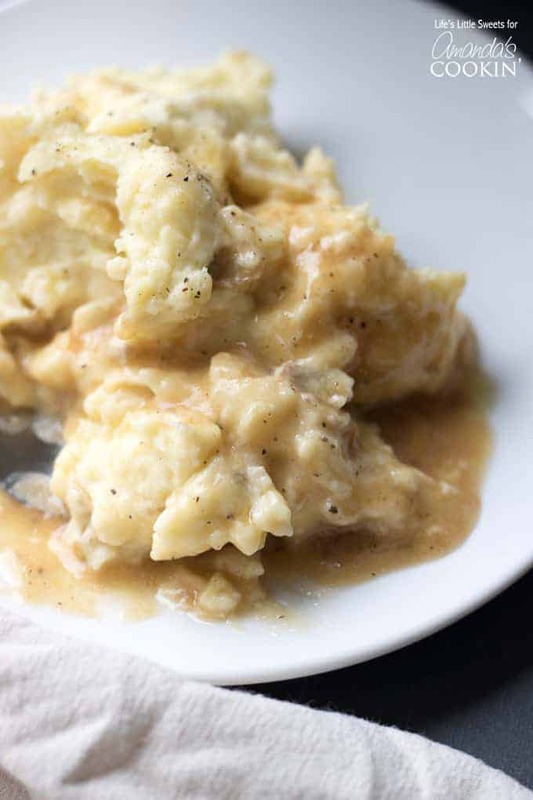 These Creamy Traditional Mashed Potatoes are rich, smooth and delicious topped with butter and optional gravy. 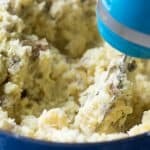 They make a terrific holiday side dish or for whenever you crave a solid mashed potatoes recipe! 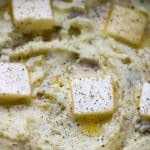 Hi Everyone, when I think of Creamy Traditional Mashed Potatoes, I think of Thanksgiving and Christmas feasts and all those favorite side dishes to look forward to. 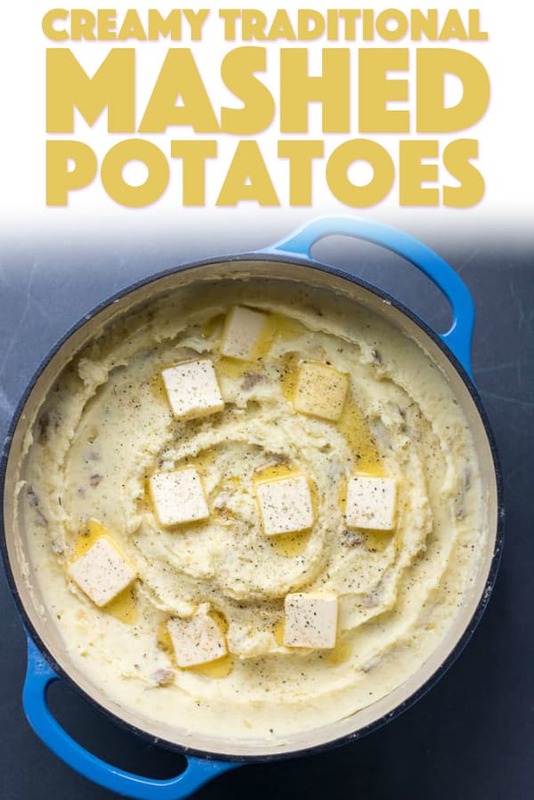 I also think of how they wouldn’t be the feasts that they are without those standard recipes that you expect to be there, like these delicious mashed potatoes. 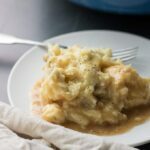 Although we love a delicious and easy crockpot mashed potato recipe, these creamy traditional mashed potatoes hit home as well! We also have brown butter mashed potatoes, colcannon mashed potatoes, and crispy roast potatoes to choose from! 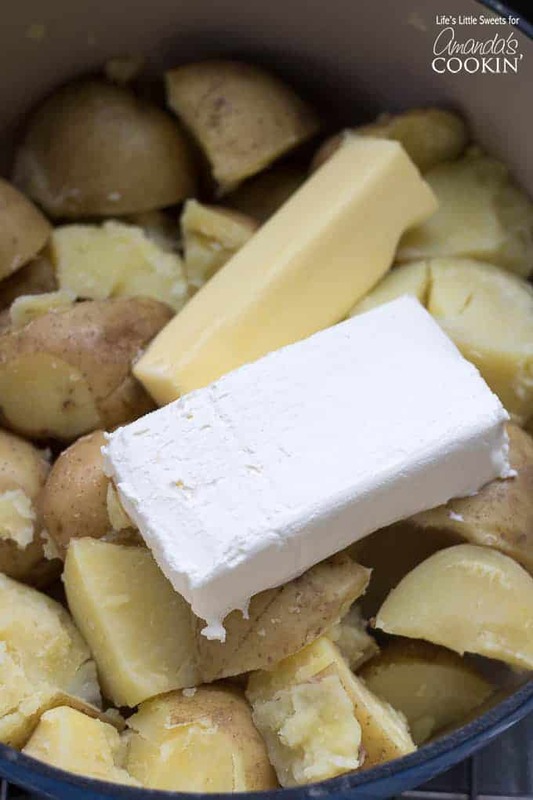 This recipe owes it’s “creaminess” to the half and half and cream cheese that it calls for and let’s not forget the richness of that butter flavor. 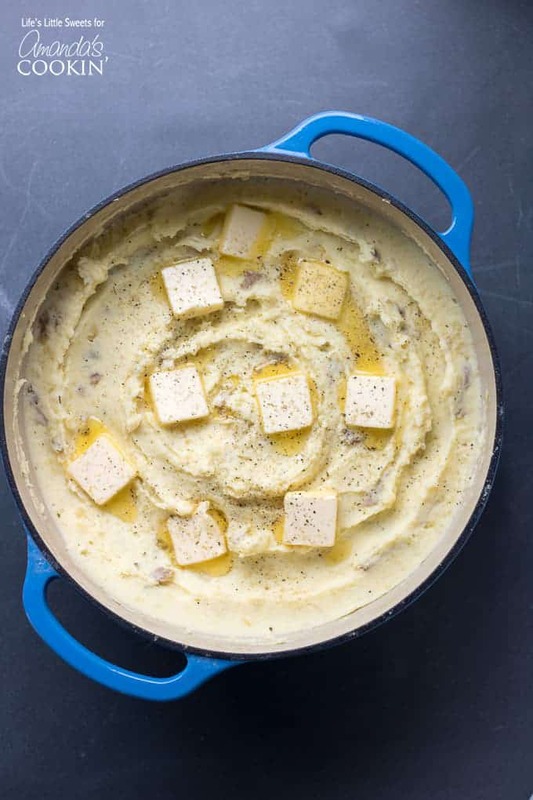 Yukon Gold potatoes are a must with this recipe because they make the smoothest mashed potatoes with a buttery color and texture. With this recipe, you have the option to remove the skins, or, you can go for a more rustic dish and leave them on. If you leave them on, I suggest scrubbing the skins very well and cutting off any rough areas. 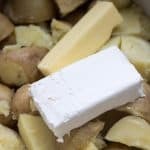 When you are cutting the potatoes for this recipe, just cut them in half and quarter the large ones. They will all be mashed after they are cooked, so there’s no need to be fussy about how they are cut. I don’t call for any additional toppings but you certainly could add a chopped, fresh green like chives, parsley or garlic scapes. I do suggest adding more pats of butter and some optional brown or turkey gravy which makes sure every amount served is going to have that lovely drizzle of butter and gravy all over it. 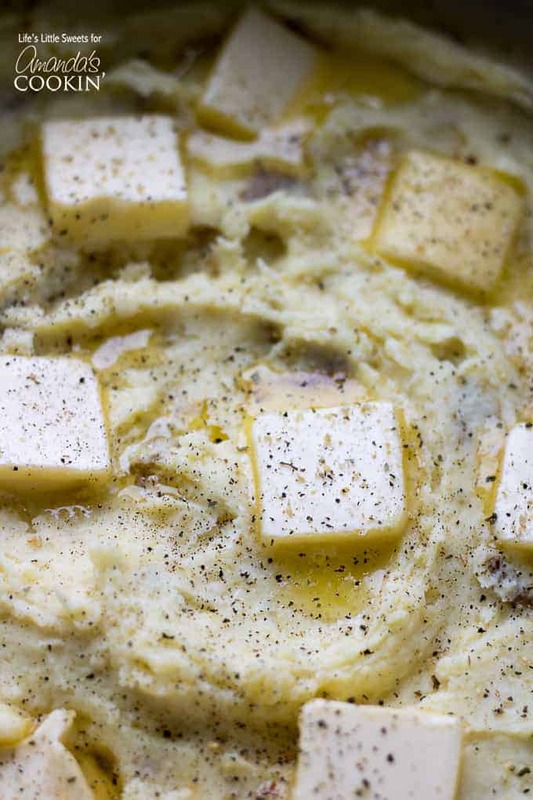 You might just want to have a whole bowl of these mashed potatoes because they are that satisfying! 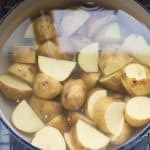 Fill a Dutch oven or large soup pot with water, add 1 tablespoon salt, add the prepared potatoes. 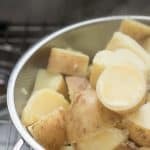 Place on the stove top over high heat, bring to a boil and then reduce to a simmer, cooking for a total of 30 minutes or until the potatoes are fork tender. Drain the potatoes in a colander, allow them to steam for a few moments and then return them to the pot. Add 1/2 cup (1 stick) of unsalted butter and the 8 ounce block of regular cream cheese. 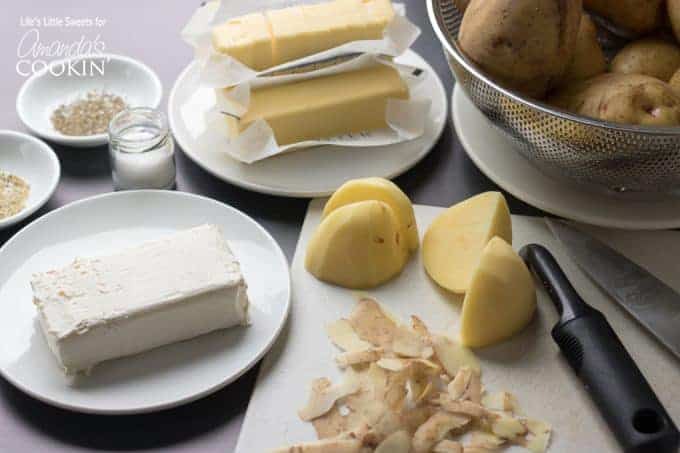 Using a handheld electric mixer, combine the butter, cream cheese and cooked potatoes. Pour in the half and half, sprinkle in the seasoning mix and pepper and combine. Adjust flavors to taste. 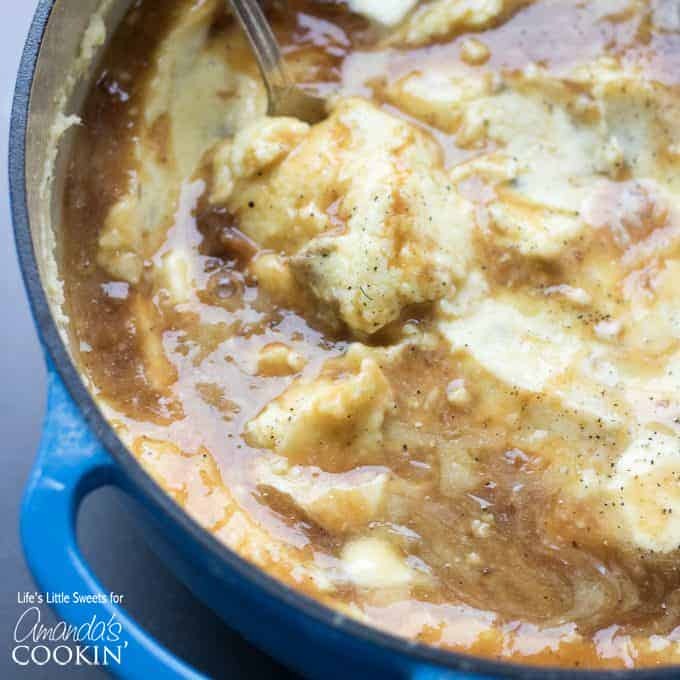 At this point you can top with the pats of butter, optional gravy, more salt and pepper to taste if you are serving right in the Dutch oven or add the toppings after you transfer it into a serving bowl. Enjoy! 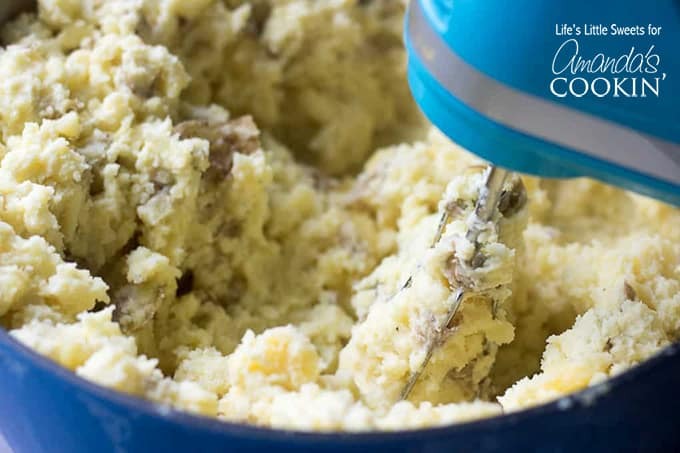 If you make this Creamy Traditional Mashed Potatoes recipe, please let me know in the comments below! 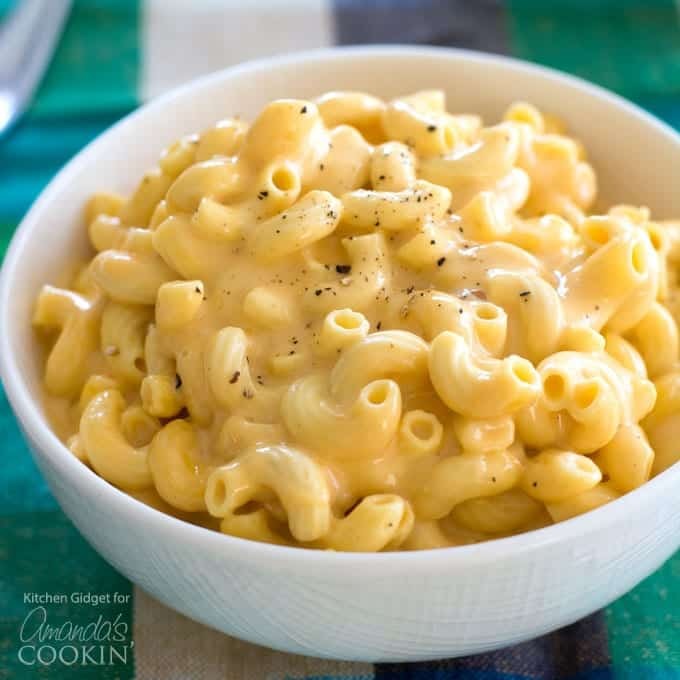 For another favorite dinner side dish, this creamy crockpot macaroni starts with uncooked macaroni. Just throw the milk, cheese, and seasonings in the slow cooker for a meal everyone will love! 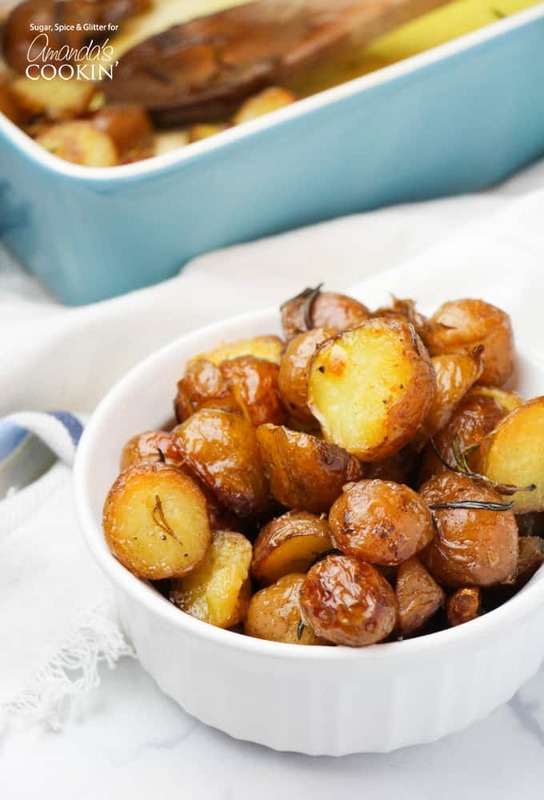 And another potato recipes, these Rosemary Garlic Roasted Potatoes are such a versatile dish – they pair well with so many dishes but I especially like them as a side with poultry thanks to that generous amount of rosemary. 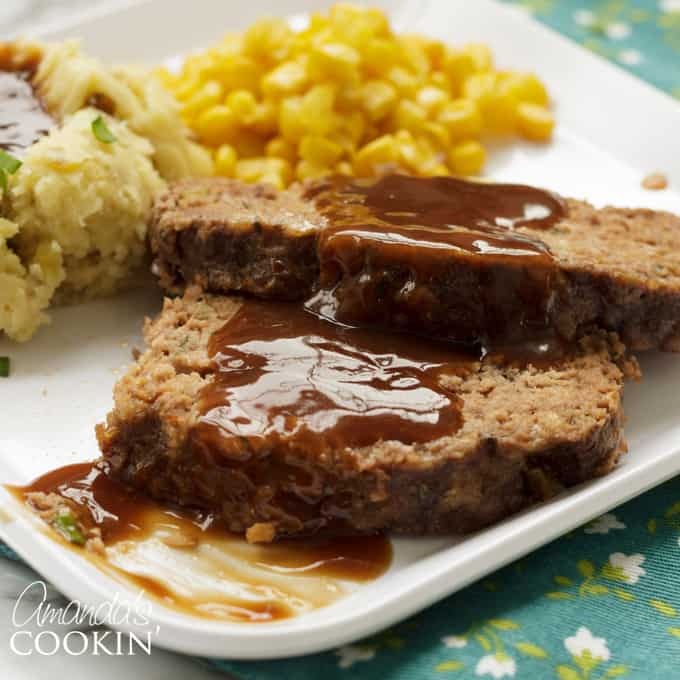 And lastly, this meatloaf is the BEST meatloaf recipe out there! 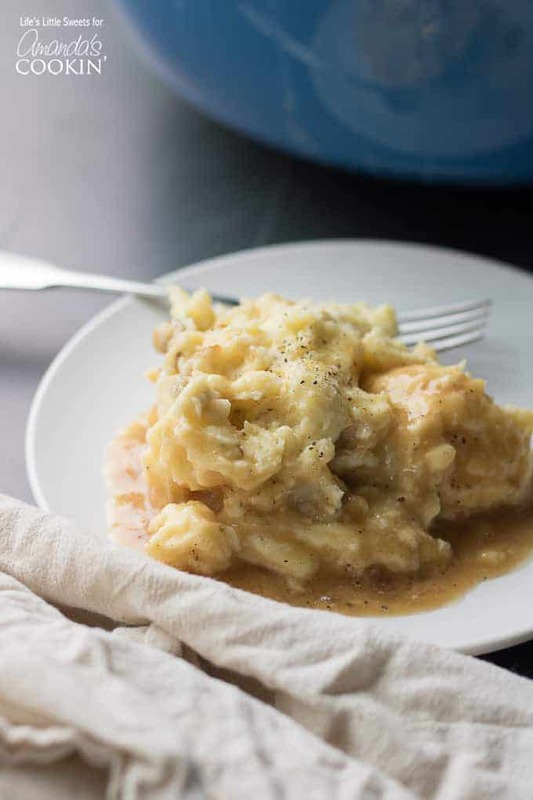 Pair your creamy traditional mashed potatoes with this dish for a satisfying and comforting meal. If making ahead (up to 2 days ahead), make sure to have them in a heat safe dish so you can re-heat in the oven. 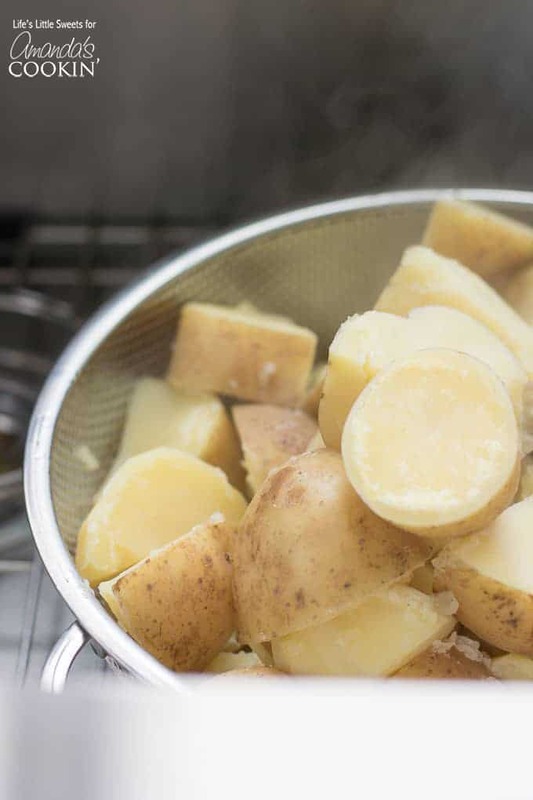 Take them out 1 hour before heating (to bring it up to room temperature), If the potatoes seem dry after refrigeration, splash with more half and half on the top, heat in a 350-degree, preheated oven for 20-30 minutes or until hot through.